Re-opened on the 28th March 2007 after a refurbishment, the Hoop & Grapes is under the Nicholson's arm of Mitchells & Butlers . The pool table has gone, along with smoking, in are guest ales, Nicholson's food and candles on the tables (I presume the candles are to encourage blokes not eating to stand as it makes for a somewhat intimate drink). As you would expect from Nicholson's, the beer is well kept, I had a lovely pint of London Pride, they also offer Adnams and Bombardier amongst others. Parts of the pub pre-date the Great Fire of 1666, which missed Aldgate, but you would be hard pushed to know which. Despite this, the character of the place has been kept and the atmosphere under the low ceilings is lovely. The pub layout is pleasant, the bar is down and to the left as you enter, there is seating to the right and a dinning area to the back, there are also couple of tables and chairs to the front. 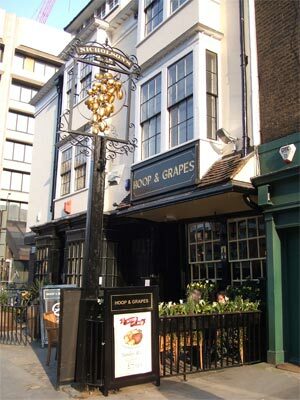 The Hoop & Grapes building dates back to the 17th Century, both it and 46 Aldgate High Street where completely restored in the early 1980's by the contractors Lewisham based Wynn, part of the Clarke Group. It was then, a very expensive development, involving propping up the original fragile timber frame with a specially designed steel frame, the timber frame is no longer an active structural element, the building work alone costing £1.2m. Before work started a dangerous structures notice had been served, the building shearing sideways by about 18 inches over time. The building was stripped back to softwood frame, decayed timbers replaced and then rebuilt to the original design, staircases, fireplaces and windows being repaired or replaced with new. During the restoration, cattle bones, a large and ancient meat cleaver were found and a riding whip was discovered behind the paneling of one of the bedrooms.